Quinoa porridge – protein and fiber rich porridge recipe made with quinoa, nuts powder and milk. Quinoa is one of the healthiest food in the world as its rich in nutrients. Its actually a seed which is cooked and eaten as a grain. Quinoa is pronounced as “keen-wah”. Being a versatile grain, quinoa makes the tasty and healthy addition to your child’s diet. 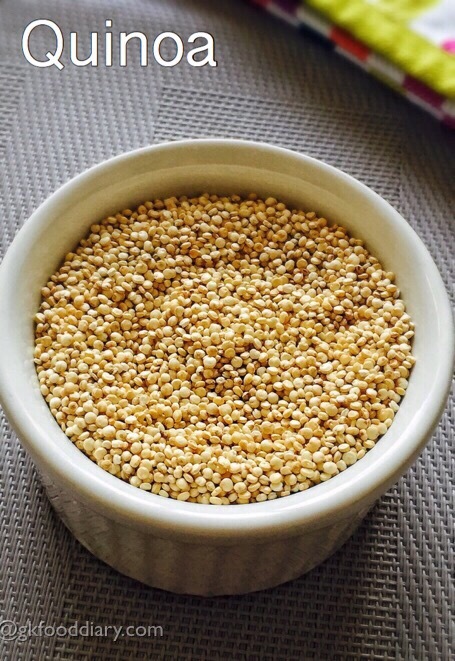 Read more on health benefits of quinoa and how and when to introduce this healthy seeds to your baby. Contains more proteins, iron, calcium and essential amino acids. 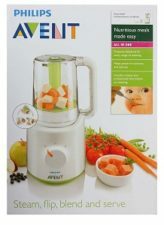 Hence it provides all important nutrients needed for child’s growth and development. High in fiber which prevents constipation in kids. Good source of Vitamin B and E.
High in antioxidants which are believed to fight many diseases. Quinoa is non GMO and organic. Easily digestible, so its ideal for small kids, pregnant ladies and sick people who are recovering from illness. How to select and store quinoa ? Quinoa is available as whole seeds and grounded flour. It is not genetically modified and mostly organic by nature. Quinoa can be stored in an airtight container in a cool and dry place. When and how to introduce Quinoa to babies? Quinoa can be given to babies from 8 months as its gluten free and easily digestible. 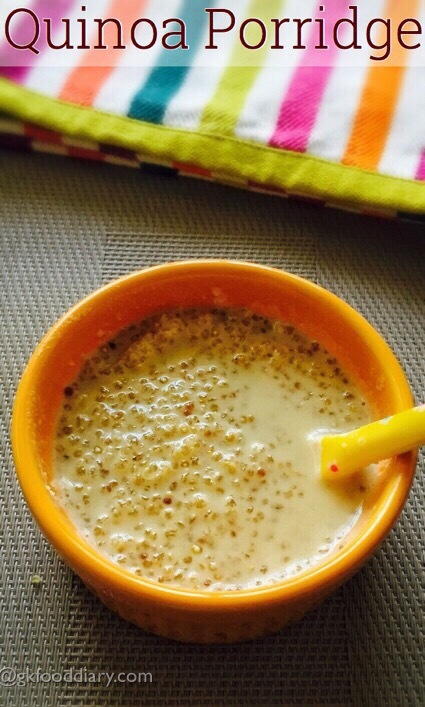 Quinoa porridge is a best way to introduce quinoa to your baby’s diet. 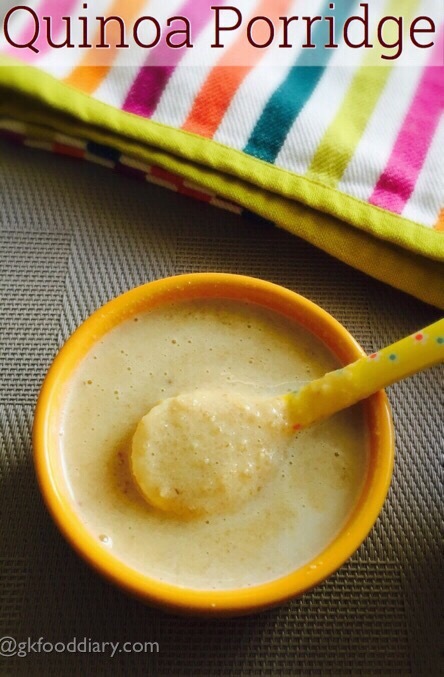 When you introduce this porridge to your baby, you can blend the porridge in a mixer or blender if preferred. 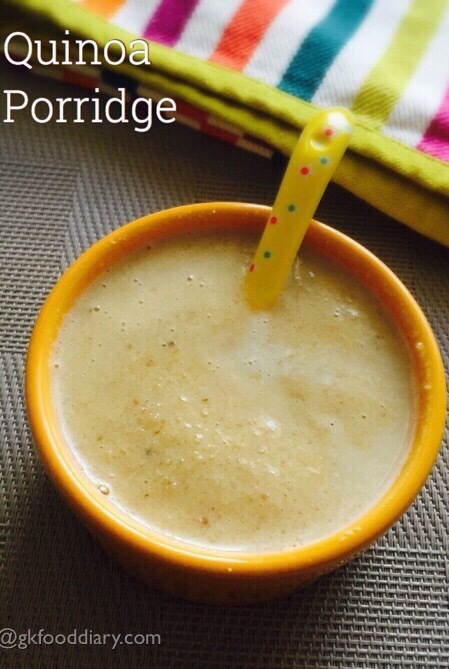 Here is how to make quinoa porridge recipe for babies and toddlers. 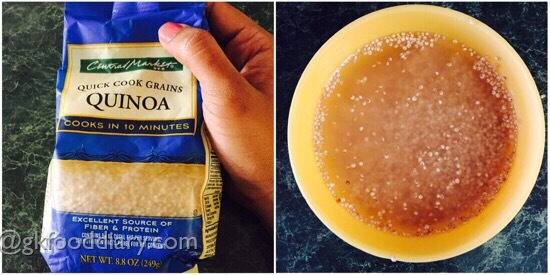 Quinoa Porridge - nutritious porridge recipe made with quiona. Rinse the quinoa in water, repeat 2-3 times until there are no bubbles appear in the water. Then soak it in water for 10 minutes and keep it ready. For babies below one year prepare formula milk and keep it ready. If using cows' milk, boil it until frothy. After 10 minutes, drain the water fully and take the soaked quinoa in a sauce pan and add ½ cup of water. Mix well, cover the pot with a lid and cook for 10 minutes. Keep it undisturbed. Open the lid, mix well once again. 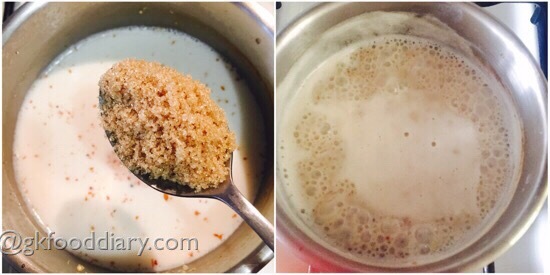 Then add the boiled milk/prepared warm formula milk to the cooked quinoa. Then add in handful of nuts or nuts powder at this stage. For small babies use only nuts powder and avoid whole nuts. Add sweetener at this stage and mix well until the sweetener dissolves. If using cow's milk boil it further for 5 minutes and switch off the flame. If using formula milk, do not boil it further. Then transfer everything to a blender/mixer. Grind it to a smooth/coarse paste. 1. 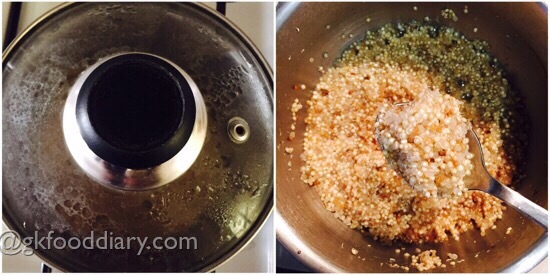 Rinse the quinoa in water, repeat 2-3 times until there are no bubbles appear in the water. Then soak it in water for 10 minutes and keep it ready. For babies below one year prepare formula milk and keep it ready. If using cows’ milk, boil it until frothy. 2. After 10 minutes, drain the water fully and take the soaked quinoa in a sauce pan and add 1/2 cup of water. Mix well, cover the pot with a lid and cook for 10 minutes. Keep it undisturbed. Open the lid, mix well once again. You can also pressure cook the quinoa in medium flame for 3-4 whistles in medium flame. 3. 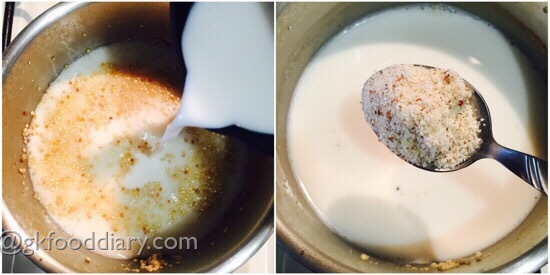 Then add the boiled milk/prepared warm formula milk to the cooked quinoa. Then add in handful of nuts or nuts powder at this stage. For small babies use only nuts powder and avoid whole nuts. 4. Add sweetener at this stage and mix well until the sweetener dissolves. If using cow’s milk boil it further for 5 minutes and switch off the flame. If using formula milk, do not boil it further. 5. 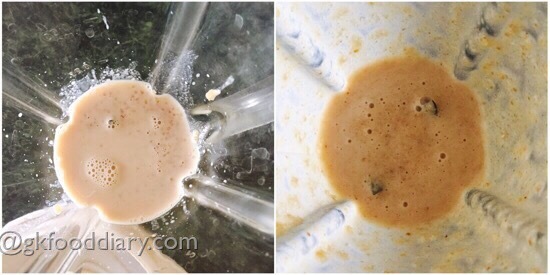 Then transfer everything to a blender/mixer. Grind it to a smooth/coarse paste. Grinding is optional, but recommended for small babies. Quinoa porridge is ready to feed your baby! You can also pressure cook the quinoa in medium flame for 3-4 whistles in medium flame. Make sure to cook the quinoa well before you add milk/formula milk. Cook the porridge for few more minutes if using cow’s milk. You can add fruits like banana to this porridge along with nuts. Avoid cow’s milk for babies below one year and use formula milk instead. 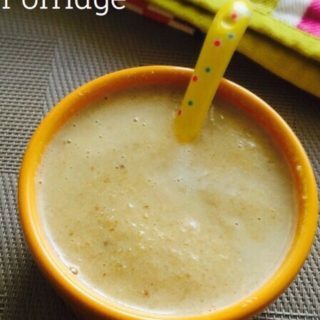 Offer this porridge plain to your baby when you start. Try to avoid jaggery/ palm sugar/ palm jaggery or any kind of sweetener at least till one year, Add very little amount than mentioned or prefer sweet tasting fruits/vegetables like apple, banana, carrot etc or dry fruits like dates or raisins. Check with your baby’s pediatrician before introducing quinoa to your baby.